Come celebrate with us the events of Holy Week at Christ Community Church in Belchertown, MA. Starting on Palm Sunday, we will spend our time remembering the work that God has done for us. Through the testimony of the scriptures we witness the establishment of the New Covenant, the death of Jesus Christ for our sins and then His resurrection for our justification. We invite you to come and see the great work that God has done through Christ Jesus our Lord! Below is a schedule of events happening at Christ Community Church during Holy Week. Please follow the links to sign up for the Prayer Breakfast and the Easter Dinner. Join us on Sunday, April 14th at 8:30AM or at 11AM as we celebrate Jesus' entry into Jerusalem as crowds shouted, "Hosanna, Hosanna, Hosanna in the Highest!" On Friday, April 19th at 7PM please come hear and meditate on the events of Jesus' betrayal, crucifixion and death for our sins. On Saturday, April 20th at 8AM, please come for a time of fellowship and prayer over breakfast, and a time to be still before the Lord as we focus on what He did for us on Good Friday and Easter. Please sign up here so we can make preparations. On Saturday, April 20th at 11am, please join us for a time of fun for the whole family! We will have Easter Egg Hunts for children 10 years and younger. Registration for the hunts begins at 10:30am. In addition to the egg hunt there will be arts and crafts and a short Easter program with singing! 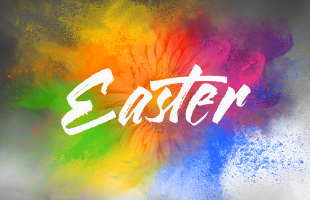 On Sunday, April 21st at 8:30AM and 11AM, come and celebrate the resurrection of our Lord Jesus Christ as he has defeated death and won for us eternal life! On Sunday, April 21st at 12:30PM we will be having a time of fellowship and a delicious dinner to celebrate Christ's resurrection! Please sign up here so we can make preparations. We look forward to having you join us. If you have any questions please visit our contact page or call the church at 413-253-0292. Let us know in the comments below which events you plan on attending.